We’d love your help. Let us know what’s wrong with this preview of The Clerk's Tale by Spencer Reece. To ask other readers questions about The Clerk's Tale, please sign up. Mixed feelings about this collection. The things I liked I strongly liked. But the things that irked me strongly irked me. Hours clot. Bird flap like passports. the dirt shines, mechanically kneading the hours of our deaths. offering their baptized scalps to fun new people like thesauruses. perhaps they came after the Civil War? It was a simple house. Two stories. Six rooms. Every wall crooked. Before the house, Indians camped there. If you listened you could hear them. when the sky plumes to a deep Jesusy blue. I was often found, half asleep. I forgot words, where I lived, my dreams. ran out of gossip. The walls absorbed me. There was every indication I was safe there. The poet is a friend and knowing him as a person adds a different understanding of the tales he spins. Wonderfully done and worthy of the praise it has received. A great first book of poems. I particularly liked the title poem and the "Florids Ghazals." Very well done. Incredibly gorgeous personal, lyrics full of contrasts: spare and lush, baroque and plain-spoken. Will go down as one of the best books of poetry of the decade. Portions that resonated with me. It is a book I will revisit many times. Right now, I intended to reread Reece's second book again. over five days. My dear, it is late. The Flagler Museum is shut. Stay with me. Remain here with me. This book of poetry introduce me to forms of poetry (like the ghazal) that I'd never heard of and now absolutely adore. It also contains such a perfect balance of straightforward, no-nonsense, little description poetry with the type of wonderful, flowing, ornate descriptions that I absolutely love and adore. Spencer Reece is an exquisite poet. The poem "Ghazals For Spring" is one of the best poems I have read in a very long time, despite how long it is. I really have to read more of this poet. This was the infamous 'back page of the New Yorker' poem, the one that was hyped, the one that got all the fancy back cover blurbs. It deserved it. The short version: His sense of place was impeccable and varied. His risky choice to include three ghazal sequences, based on the ancient Persian form, were riveting. Rare enough to feel it, so it should be mentioned: I loved everything about this book. Spencer Reece came to write and present at Lesley University when I was in my MFA program, and I loved his writing then. This is his first book of poems, and I'm still reading his latest collection. The complexity and loveliness of every image, whether it is animal, geographical, or emotional, is simply stunning. Probably the best "first book" contest winner I've ever read. Classical style, emotional depth. Authentic voice. I went to Spencer's reading earlier this month, and this is the best poetry I've heard/read in a long time. My favorite poem was Loxahatchee. It felt very different from the rest of the collection and was more deeply rooted in the natural world than in the narrator's self. Classy, honest, focused. This book is one of my all time favorites. Reece has an amazing knack for inhabiting a place and offering it to the reader with obsessive poetic clarity. Loved these poems and recurring themes of place and impermanence. The Midwestern, Minnesota connections were wonderful. I know I probably should find more to like in this debut collection of poetry, it won a couple of awards and the New Yorker devoted an entire back page to the title poem (which is the best piece in the collection). It's very clear now that I'm drawn to more linear, narrative voices in poetry. Certainly, The Clerk's Tale (the poem) fits this frame, so too did 'Cape Cod', but much of the remaining poems, I'm sure lend to some sort of brilliance, but I found the voice and rhythm too repetitive and m I know I probably should find more to like in this debut collection of poetry, it won a couple of awards and the New Yorker devoted an entire back page to the title poem (which is the best piece in the collection). It's very clear now that I'm drawn to more linear, narrative voices in poetry. Certainly, The Clerk's Tale (the poem) fits this frame, so too did 'Cape Cod', but much of the remaining poems, I'm sure lend to some sort of brilliance, but I found the voice and rhythm too repetitive and much of the collection simply felt unconnected. His first book of poems, won the Breadmaker's prize or some such thing. Calls Deborah Keenan a savior. 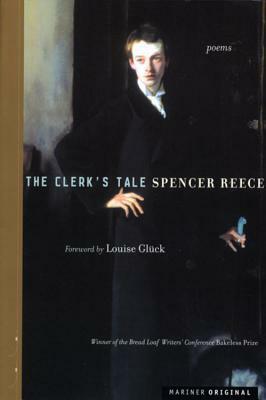 Reece was assistant manager at a Brooks Brothers in MOA, and the title poem chronicles that, as well as alludes to Chaucer. "Sometimes the snow falls like rice"-- this line actually made it into my dream one night. Good poems. There is an artlessness to Reece's poems, in that he makes it appear as if no effort went into their creation. I need to mull over the collection longer before writing more. An uncommonly virtuosic first book of poetry from a heretofore unheard of poet. Even when Reece is writing about Florida, I feel like he takes me places I have never been. Oh God so beautiful--and even better when he reads it. Gorgeous. read it cover to cover. read it again.